...as did this noogie cute Coreopsis tinctoria--I mean, even the bud has gorgeous color. A little splash of color. ... and attract many busy pollinators (look at the hind legs, noogie!). ...and, oh yeah, it has fruit, too. My first rose ever 'Golden Wings' is doing well, despite being in my care. Thanks, Nancy Lindley, for the recommendation. ...and open up a warm reddish brown. The planter on my north-facing side porch (the only non-veggie container I have) is looking really good. I planted those Coleus from seed! The elephant ears (Colocasia 'Illustris' circa 1902 from Ann Arbor's Old House Gardens) come in the house over the winter, and ferns I have up the ying yang and treat as annuals. Bizi doesn't normally photobomb (!) my shots but she gives a good size reference. 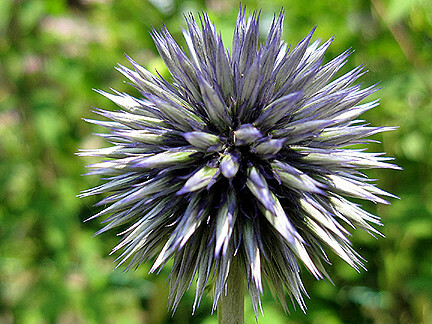 This Echinops reminds me so much of Chihuly's Blue Moon at Meijer Gardens. 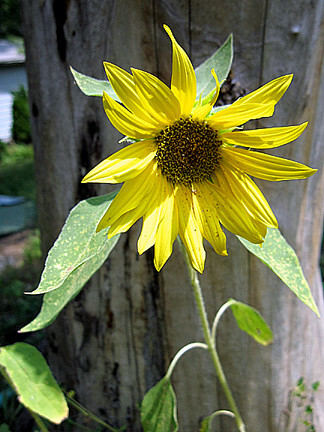 One of the sunflowers that grew from spilled birdseed. I have three rose of Sharons, two white and one purple, along the bed next to my neighbor's driveway. I got them as tiny sticks in 2004 from a person in my master gardener class, and now they're at least 6 feet tall. 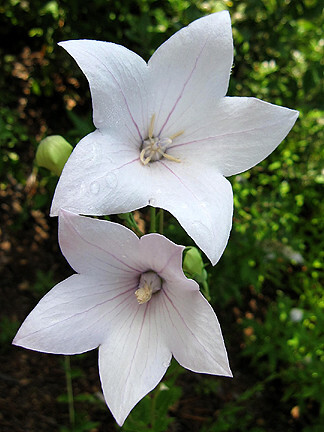 My balloon flowers tend to get very leggy because I forget to cut them back in time. 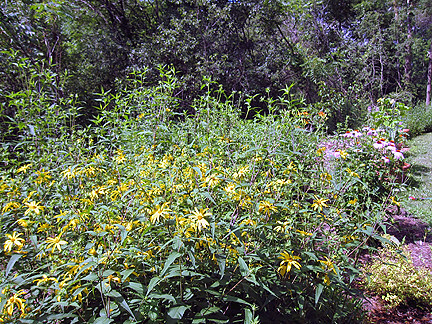 This huge clump (maybe 10-ft. wide by over 5-ft. tall) of native sunflower (Helianthus divaricatus) is in my south wild bed. 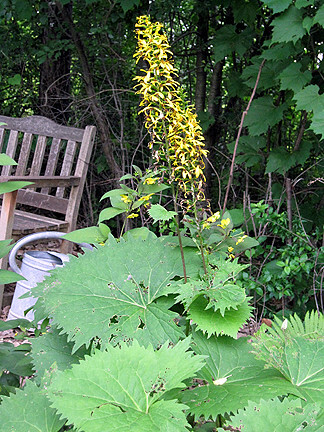 Ligularia stenocephala 'The Rocket' does indeed rock it in my east wild bed. 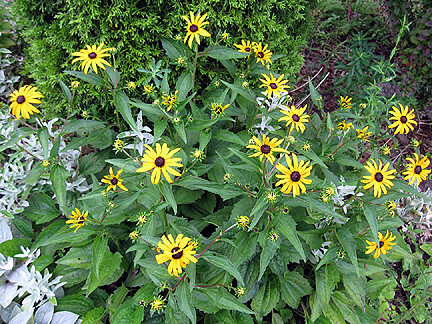 I have tons of clumps of Rudbeckia, even in shady locations. 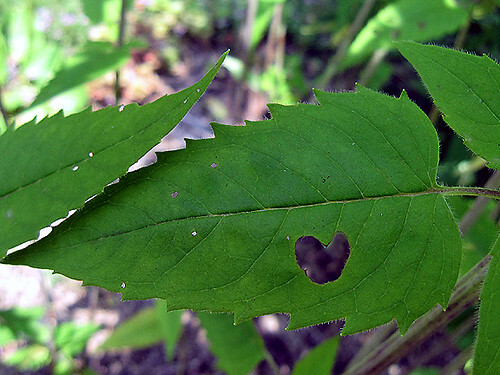 I found this heart-shaped chomp in the bee balm leaf and immediately thought of Katie. 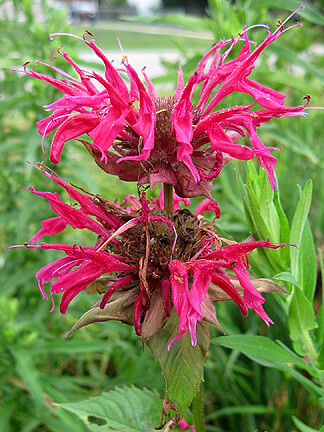 A few cultivar bee balms (Monarda didyma) have self-seeded where they want to go. Front of the house, looking south. 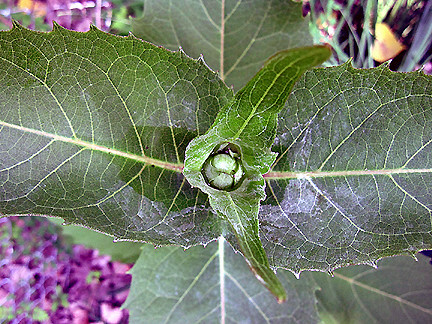 Yes, friends, things are looking a little wild at Garden Faerie's Musings this year. 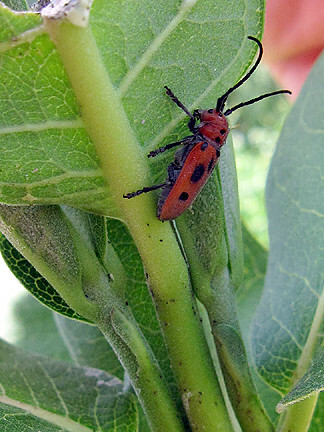 And check out this cute red milkweed beetle on, amazingly enough, my milkweed (Asclepias syriaca)--thanks Lisa for the bug ID in your most recent post! These beetles are immune to the toxins in milkweed but absorb them so they taste yucky to predators, much like monarch and viceroy butterflies. Ah, orange. Glorious orange. 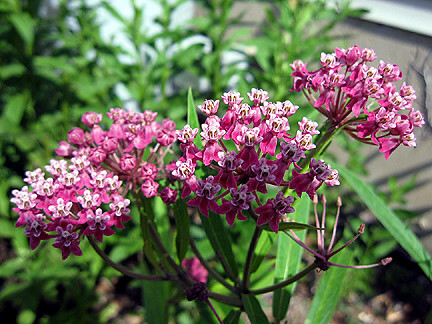 Butterfly weed (Asclepias tuberosa) is one of my favorite flowers. 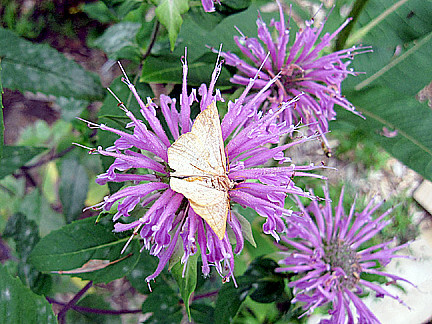 Attracts butterflies, my favorite color, no big surprise there. Update: I just got clarification from the regular vet who wasn't there yesterday when Jimi was discharged: I only have to isolate him at night (because he usually sleeps next to me and 8 hours is too much exposure) and if I leave the house (so I can be sure he doesn't use Fiona's litter box or eat her food). It's a good thing I'm a self-unemployed hermit I work from home! Good Morning Monica, I too am up before I wanted to be. Another big storm just ripped through here. I usually sleep through storms but this one was quite noisy with flashing light. Your garden looks delightful. 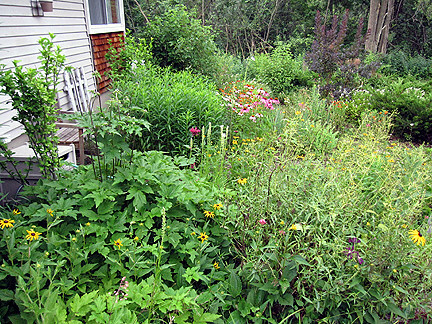 Of course I like a "full" garden. I hope your kitty gets well soon so you can all sleep better. Poor Jimi. I showed Shadow his picture and told him that he's going to be put in jail if he doesn't stop bringing all the dirty laundry up from the basement while I'm sleeping or at work. Wow! Lots doing in your garden. Fabulous photo of the bee. I'm glad to hear Golden Wings is so dependable. I will have to add it to my collection. Except for one weekend, Sept. sounds good for Chibot--I'll be in touch. Appreciate your photo perspectives, love the bees. My sympathies on your cat situation, that's worse than the cone for a dog. Poor James. Animals just don't understand and that is what makes medical so hard for them IMHO. Your pretties are wonderful. A friend was asking if anyone knew what kind of flower she had at garden club and none of knew. Now I know! 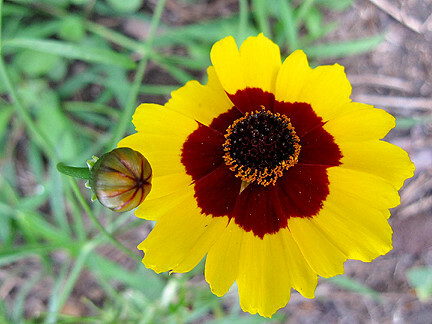 The coreopsis tinctoria. I called her and told her. She unfortunately does not use computers. 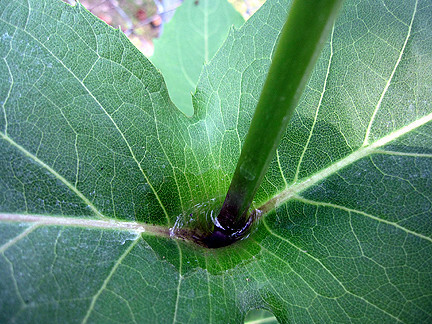 It is a cool plant! Thanks for showing it. All your lovelies look good. Even the gooseneck. How the heck do you keep it in check?? I am very impressed with your early Bloom Day post! Please don't tell me you are the kind of gal that has all her Christmas shopping done a month early! 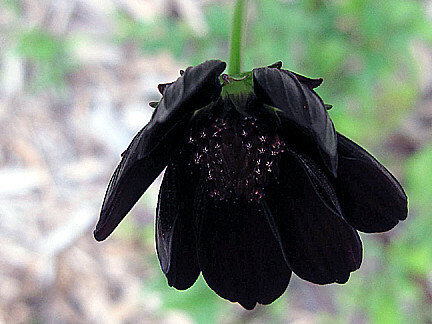 I am in love with your Chocolate Cosmos! But then I am in love with anything chocolate....mmmmm, Dove Dark Chocolate...focus--focus. Poor little Jimi. It's so hard to see them sad, sick, or hurt...no matter how often you tell them it is for their own good, they just don't understand (much like human children). I hope he is better soon and his treatment a success. I can understand why you put up with Loosestrife's "loose" ways. It is striking, and I bet the hummers and butterflies love it. Your garden looks wonderful. So much going on--so many blooms--so full and vibrant. 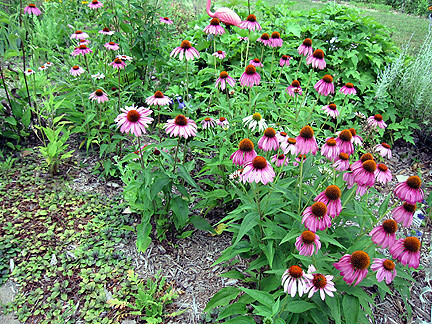 Lots going on this month in your garden Monica, it doesn't look wild to me, just lush & beautiful! 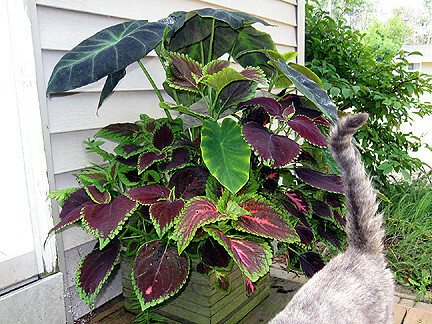 That planter with the Coleus & Elephant's Ear is really doing great and love how your kitty got in the pic. lol ;) Sorry to hear about your other kitty being ill, hope he gets well soon so he can be less isolated from you & the rest of the household. 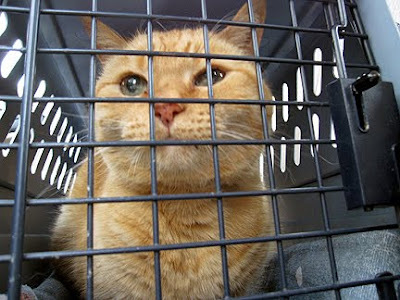 Hi Monica, good luck with the kitty, I hope he recovers quickly and completely. Your Mardi Gras is looking great. Mine isn't blooming very well this year. hello Monica! The diseases cats can get~We do love them a great deal and want them to be healthy! Give Jimi a nice purrfect pat from me. 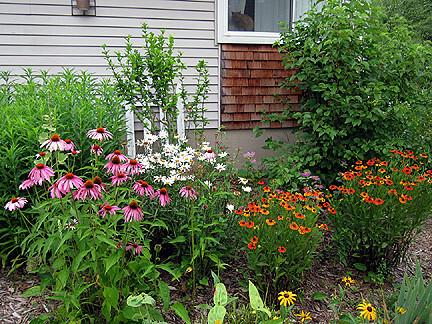 Your garden is lovely Monica....it shows, all the hard work that you have put into it. 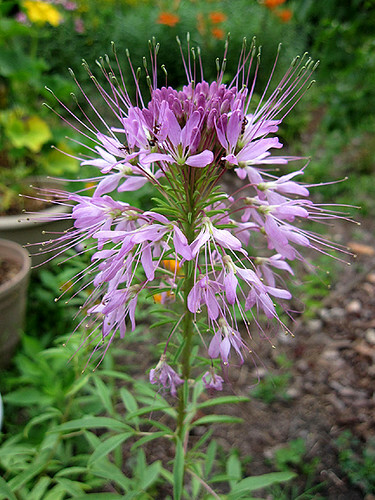 I love the milkweek and the cleome.....both are gorgeous.....wish I had them in my garden. Those chocolate cosmos are beautiful. Hi Monica! thanks for stopping by.. 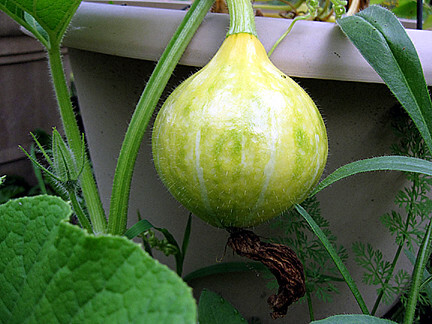 The Vchiki Kuri Squash.. It's flower and it's fruit are Gorgeous! 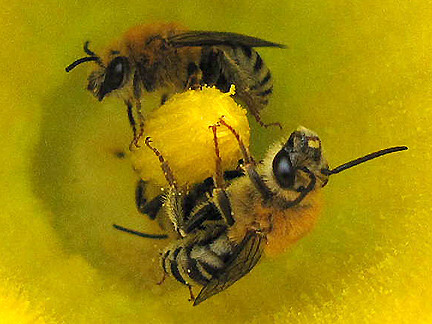 the bees are really cute too" all coated in pollen.. I too love Orange in the garden both it and the color yellow make me happy! Did you happen to see the Sunflower planted by the birds in my photo? P.S.. Monica I forgot to mention your new profile photo.. It's really cute"
I like it of you standing in that tall corn..It makes such a pretty back ground and it matches your blog page..
26 days early. Crack me up. Sorry to hear Jimi is uncomfortable. This too shall pass! Wow, you have some great flowers. I like clumps. it looks so much more organized. 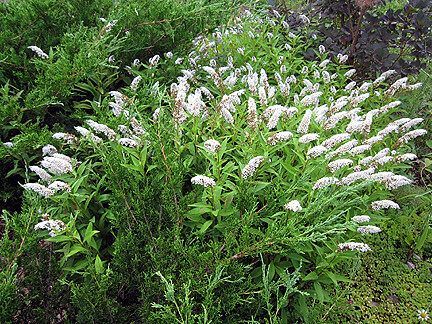 Your gooseneck loosestrife is beautiful, and has such a beautiful history. I don't know what that beetle is, but I get them in my garden too. Hope your kitty gets better soon. Monica, what a wonderful trat to see so much of your gardens. They are all lovely. Not wild, just full of beauty. 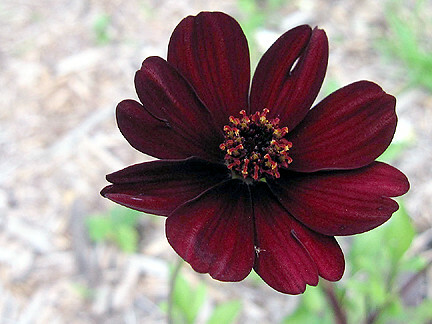 :) Be sure to save some othe chocolate cosmos for the seed exchange-wow what a color. 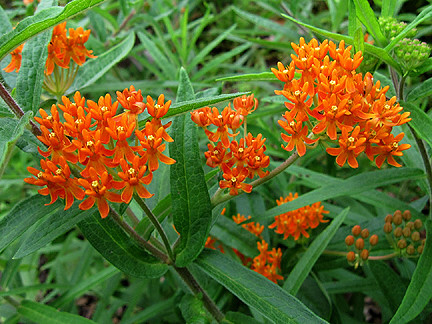 I have a yellow butterfly weed that I am going to try to save the seed from and will send you some to go with the orange. They really look good together. Hope kitty starts to feel better soon and I hope you can both start getting more rest. 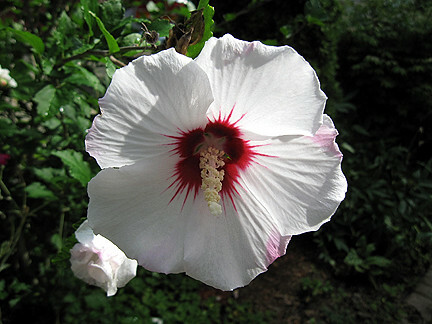 Hi Monica, you have very beautiful flowers there, but most of them are alien to me, as i am from the tropics. 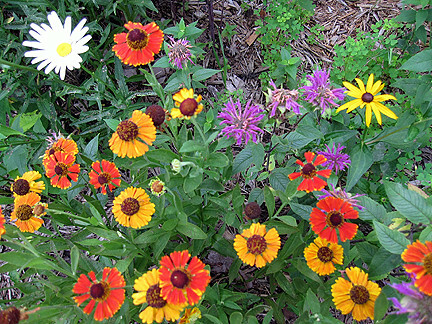 But what specifically caught my attention is the very unique color of cosmos, we only have the yellow and orange, or pink somewhere though not with me. Do you think they might also grow here. How i wish to have some seeds of those. hehe. BTW, sorry about what your pet is going through. Beautiful photos of your beautiful blooms Monica! I'm so happy the kuri squash is doing well and producing fruit. I too love the blooms. I think you'll you'll love the brilliant orange color as they ripen. 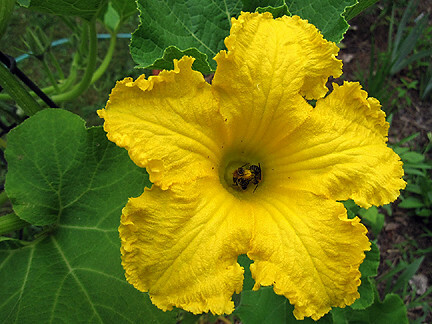 I hope you'll enjoy eating the squash as much I do - best squash I've ever tasted - yum! I hope Jimi's treatment keeps him around for a good long time, and makes the sacrifices you're both making well worthwhile. I know how much he means to you. Monica, I like that, self-unemployed hermit. I'm one too when I get the chance. I'm glad he doesn't have to be cooped up all the time. Fantastic pictures. 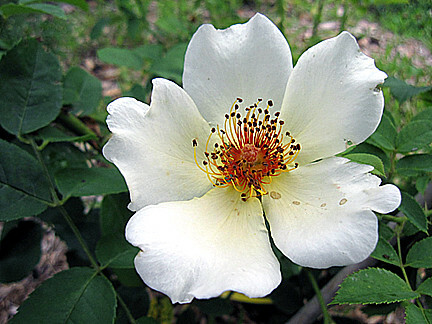 I love Rosa 'Golden Wings' - one of the best singles. Have you seen 'Mrs Oakley-Fisher'? It's also single, but a rich apricot. 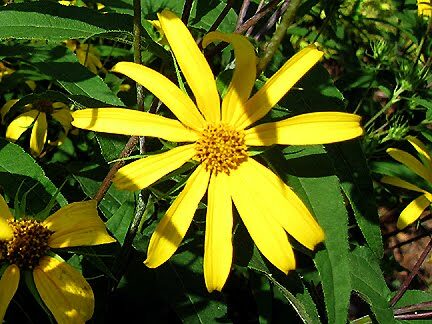 The Coreopsis tinctoria gets my vote, though. What a classy plant! I'm so amazed with the beautiful flowers you have in your garden. Keep it up.